A thunderous roar of welcome greeted the Queen and Prince Philip last month as they joined the audience in the Albert Hall to watch the 100th Anniversary Royal Variety Performance. This was clear evidence, in case anyone doubted it, that as this crowded and exhausting Diamond Jubilee year draws to its close, our 86-year-old monarch and her 91-year-old husband have achieved the zenith of their popularity. Harsh though it may be, it seems impossible to imagine the future King Charles III and Queen (or Princess Consort) Camilla ever receiving such an overwhelming demonstration of public affection. It is not so hard, however, to imagine the Duke and Duchess of Cambridge, my near-neighbours on the small, windswept Isle of Anglesey, inspiring such an ovation. Charles is not my favorite royal but I would really *despise* to see him give up and let William Middleton have the throne before it is absolutely unavoidable. I wager the Midds might have paid this to be written; after all, these types of pieces were written right after the engagement announcement. Eminent royal historian? I've never heard of him. I'd love it if both PC and PW stood aside, but dreams are free. At least PC "works" (in the royal sense, if not the everyday sense). When the Queen goes, the UK press (Daily Mail especially) is going to get vicious and will batter Charles to give up the Throne until he drops. I don't think William would make a good King. I don't think so either. Before the Midds I thought he'd do okay, but not now. I still think Harry would make a fabulous King and Beatrice Queen. But then I'm an 'nasty' American. I agree with you, Harry would do well. But he needs to tone down some of his comments about the press, or the notion that he's as pathetic as his brother is going to gain weight over time. Some historian. During Queen Victoria's time there were three heirs living: Edward VII, George V, and Edward VIII. The succession of Kings and Queens has not always been hereditary in Britain. In Anglo Saxon times they had a council called the Witan who would choose the next monarch. Perhaps we should go back to that. I love the Celts and Anglo Saxons as they had some very good idea's and woman had rights. An Anglo Saxon woman could own land and wealth in her own right. Much more forward than the Victorians whereby once a woman got married all her wealth became her husbands. The Witan was formed of religious and prominent people. When you think about it, the RF isn't really all that Anglo-Saxon; they are Hanoverian Germans who have married Danes, Germans, Greeks (Philip), so Diana and Fergie were the first infusion of English genes and for all that they were Stuart, the Stuarts are primarily Scottish. So it's been quite a while since there has been a genuine English King in the purest sense on the throne. Even the Tudors were largely foreign, Henry VII being Welsh and Henry VIII marrying the Spanish Katherine of Aragon and having Mary, then there was Anne who was English and then Jane who was English, but at the same time, still partially foreign since the kids were half Welsh. Now with the Windsors they are largely foreign so really, the RF is not at all attached to any real English tradition. A lot of the stoical garbage is purely Germanic along with many other aspects of royal culture that has filtered down. Being a history fanatic, I've read about the English temperament and it is certainly not stoical. Anglo Saxons were a Germanic people from Denmark/Jutland. When you go back a long way the Royal Families are very interconnected including some of the Eastern European countries. King Harold and Edith Swan neck's daughter (my avatar) fled to her uncle after the Normans conquered Britain and married a Prince of Keiv. One of her descendants eventually married into the British Royal Family. 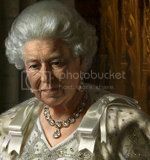 The Queen can trace her ancestry back to the Anglo Saxons Kings. Another Anglo Saxon Princess married a Scottish king and their decendants marry into the English Monarchy. So whilst the Anglo Saxon Kings are no more the line has not been lost via the females. Note. The term Germanic in the context of my post refers to the Indo European group. Prince Philip has predominantly Danish and German ancestry. His paternal grandfather, a Danish Prince, was elected King of Greece in 1863. His paternal grandmother was Russian, not Greek. On his maternal side there is pretty much only German blood. Philip renounced his Greek nationality to become a British subject. Above Prince Charles there is only really German, Danish, and Russian blood, with a bit of Scots from the Queen Mother. The Hanoverian line is via the Stuarts. A Stuart princess married into the Hanover Royal family. She was the mother of Prince Rupert of the Rhine who fought with Charles 1 in the Civil War. He was nephew of Charles 1, so the link would be through the daughter of James 1 and V1 (Scotland) Anne of Denmark. So the Hanoverians were direct descendants of Mary Queen of Scots and Lord Darnley. The present RF can trace their ancestry back to Anglo Saxon Kings but it is through female lines. The links are there but not through the male line. Just as a matter of interest Anne of Denmark has a interesting pedigree. I thought that you may find this of interest as they are such colourful characters. The lady that links the Stuarts and Hanoverians is Elizabeth Stuart daughter of James 1 (V1 Scotland) and Anne of Denmark. She was sister to Charles 1, grandaughter of Mary Queen of Scots and grandmother of George 1. Margaret Tudor is the link between the Stuarts and the Tudors. Sister to Henry V111 and married to James 1V Scotland. That's were the Stuart claim came from although Lord Darnley was also related to Elizabeth 1. Mary Queen of Scots was the grandaughter of Margaret Tudor. So Elizabeth 1 executed a Queen and a relative. That's why I love coming to this forum- I always learn something new. IMO Any article the Daily Mail writes about Royalty is tinged with the mantra "promote Kate, promote Kate,promote Kate." IMO this is just the Daily Mail's way of getting a Queen Kate, sooner, than later. They don't want a old Charles and old Camilla too unpopular, a Queen Kate (and balding King William ) would be a godsend for the Daily Mail they'd be drooling on themselves more than they do now. Two things will bother me when the Queen does pass on and that is Camilla as Queen and Kate as Princess of Wales, it will be absolutely unbearable. If HM lives another 10 years, there's a chance that Waity will buckle under the strain and be kicked out on her skinny a$$. Both Fergie and Diana reached breaking point within 10 years - with Fergie it was almost immediate, and it took the courtiers about 3 years to achieve their goal. I see Waity in the same league as Fergie was... to her credit, the latter has actually improved in recent years and I don't think Waity ever will. Imagine what Waity will be like if Carole passes away in the next few years (from her lifetime of smoking and fad dieting perhaps?) She might reach breaking point sooner. Anything can happen. And I am certain that republicanism will grow in popularity with Charles on the throne. Much of the support for the monarchy is only because of HM and PP. Like Diana said in her Panorama interview, Charles will find it restricting to be the monarch. He's unlikely to stop writing interfering letters to UK and foreign politicians. The elected government got rid of Edward VIII because he wouldn't stop interfering... I am sure they can do it again if they have to. It was also largely the courtiers who wanted him out as well. The courtiers have been servile, but it's only a facade; I wager they are chomping at the bit to let their ancestral cutthroat tendencies loose on the Windsors. As for HM, HM has failed. She threw her strength away on viewing 'female inferiority' as the 'natural order' of things. So realistically, I do not believe that HM is all that well respected at this point in time. I'm not a Brit , however I do have an opinion I like Charles and hope someday he'll be King. Better than William and KM . Not those two lazies.